The increase in metal capture rates across both programmes averaged at 12.9% over the six week period of the campaign. Post-campaign attitudinal surveys showed that the campaign had made an impact on householders, in terms of recall and prompting behaviour change. 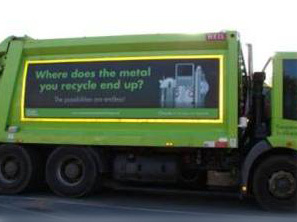 The MetalMatters pilot project aimed to develop best practice guidance for capturing metals at the kerbside. The pilot featured an integrated communications campaign using direct mail, advertising and PR activity to raise awareness in two local authority areas. Carbon impact saving of 255 tonnes CO2 equivalent during the campaign. This equates to an estimated annual equivalent saving of 1,895 tonnes of CO2 per year.